The cost of CORE is the standard resident or non-resident tuition rate plus an additional $1,989 activity fee. The activity fee will be assessed after enrollment in CORE courses and separate from tuition. 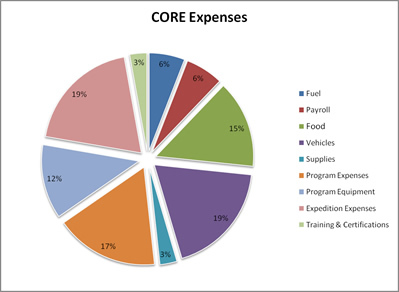 The fee covers all of the student's food, transportation, group equipment, and certification fees during the CORE semester. Please refer to the chart below to see how the activity fee is utilized. In addition to the activity fee, CORE students are required to obtain all of the required equipment on the CORE Equipment List. Outdoor equipment can be very expensive so we attempt to provide several opportunities prior to the spring semester for incoming CORE students to acquire adequate but affordable equipment. Due to the fact that the activity fee and the equipment list are mandatory for involvement in our program, students may be eligible for additional financial aid.